Experience one of the Pacific Northwest’s most dynamic cultural hubs on this small-group Portland sightseeing tour. As you travel by luxury vehicle with your naturalist guide, explore green parks and diverse neighborhoods and stop by one of the largest independent bookstores in the world. 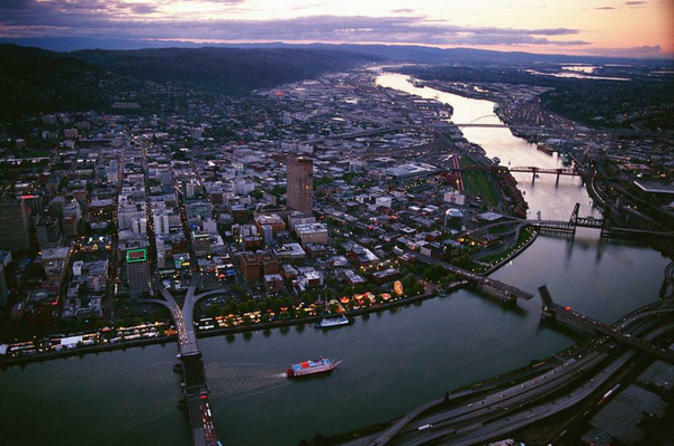 You’ll be treated to morning tea and pastries, as well as scenic views, with round-trip downtown Portland hotel transport included. After downtown Portland hotel pickup in the morning, travel by luxury vehicle through Portland on a 4-hour sightseeing tour. Enjoy tea, pastries and seasonal snacks while taking in scenic views of the city and the surrounding volcanic peaks at historic Pittock Mansion. This mansion was home to influential Portland pioneers Henry and Georgiana Pittock from 1914 to 1919, and is now a city park and treasured landmark. Next, explore the neighborhoods of Portland’s four main quadrants: Northeast, Northwest, Southeast and Southwest. Each quadrant has its own distinct feel and unique attractions including art galleries, boutiques, cafes, restaurants and performance venues. Visit the Pearl Disctrict, Nob Hill and Hawthorne, and hear about the history of Portland’s ten well-known bridges from your guide. You’ll also explore at least two of the following parks: Washington Park, Mt Tabor Park, McCall Waterfront Park and, depending on the season, the International Rose Test Garden. Your guide will bring the parks alive by identifying the flora and fauna. End your tour at one of Portland’s greatest treasures, Powell’s Books, one of the largest independent bookstores in the world!